One of my favorite things to use on our homestead is raw organic apple cider vinegar for healthy chickens. It is easy to find and purchase, simple to make and has so many uses I highly recommend anyone add it to their livestock arsenal. 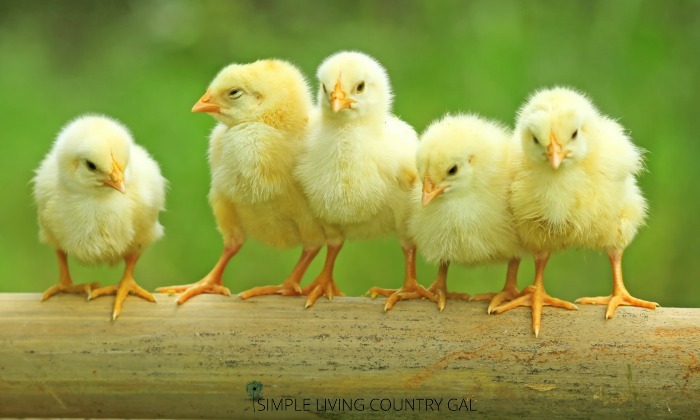 It is so easy to use apple cider vinegar for a healthy flock you would be crazy not to try it. 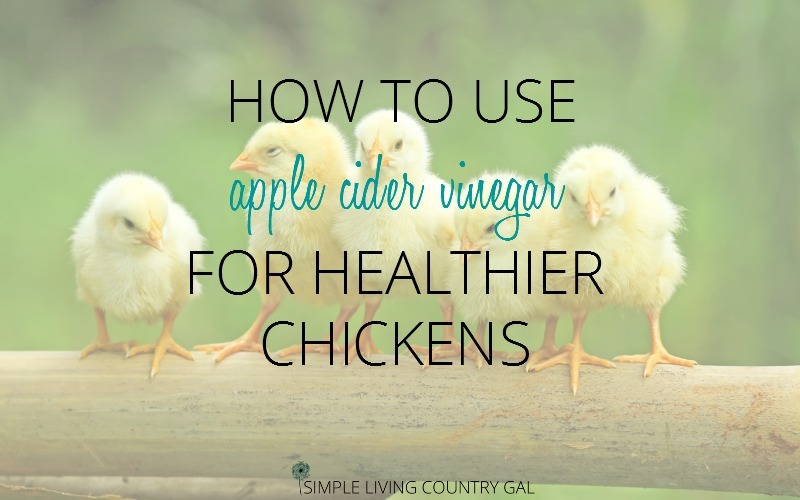 Although ACV (apple cider vinegar) works wonders with most if not all animals, this post will focus only on chickens. I love to treat my animals as naturally as possible. Promoting a healthy environment in both my birds and their surroundings is so much more beneficial than waiting for sickness to hit. Building up immune systems in all my animals is something I focus on daily and is the number one reason my livestock is healthy and strong today. This is especially important if you free range your birds. A healthy immune system can prevent them from picking up nasty disease as they are out foraging on their own. Disclaimer: In accordance with FDA guidelines, the information and products offered on this website are not intended to diagnose, treat, cure, or prevent any disease. These tips are from experience and learned from other chicken owners, none of these results have been substantiated by scientific studies. Most of my tips listed below ask for 1 tablespoon of ACV to 1 gallon of water. It is important to note that using ACV with a metal waterer is a big no-no because of the acidity. The apple cider vinegar can corrode metal and possibly contaminate the water which can be harmful to your chickens. Always use a rubber or plastic waterer when using ACV in your flock. I have several of these rubber water bowls that I use for my many of my animals. They are simple to move, easy to clean and sterilize, and very durable even in the winter. 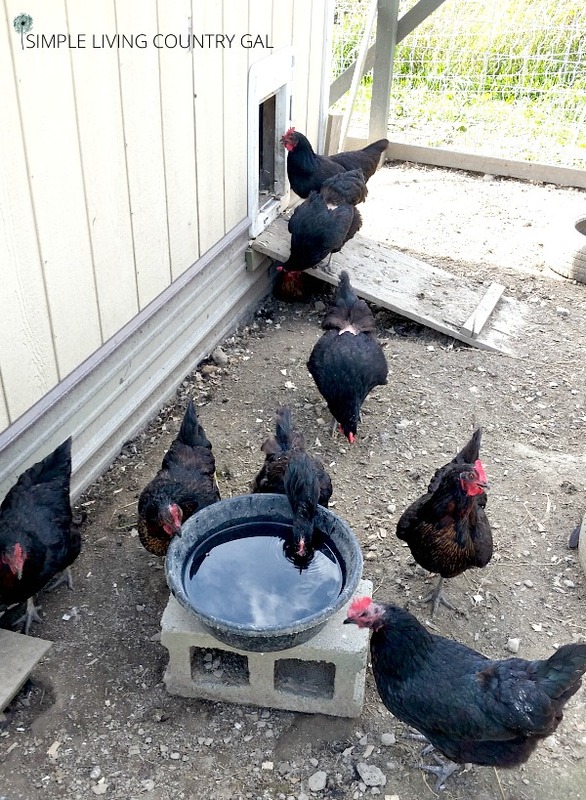 Ninja Tip: keep water bowls up off the ground to keep your hens from soiling the water. I keep mine on cinder blocks in my coop and my runs. It is important to use only organic apple cider vinegar with the “mother”. You can read about my favorite ACV below and the benefits of that specific brand. You can also make your own which I will show you how to do later! Use #3 Promote water consumption. Most if not all chickens love the taste of apple cider vinegar and it encourages drinking. It also keeps the water clean and clear of bacteria. I would not depend on the ACV to keep your water clean, however, always ALWAYS change your animals water at least daily. One of the easiest and most effective ways to ensure the health of your flock is to keep all water sources clean. It is simple to do and very beneficial. For that reason, I change my chicken’s water 2-3 times a day but only add the ACV once. One of the easiest and most effective ways to ensure the health of your flock is to keep all water sources clean. It is simple to do and very beneficial. For that reason, I change my chicken’s water 2-3 times a day but only add the ACV once. Use #4 Better eggs. 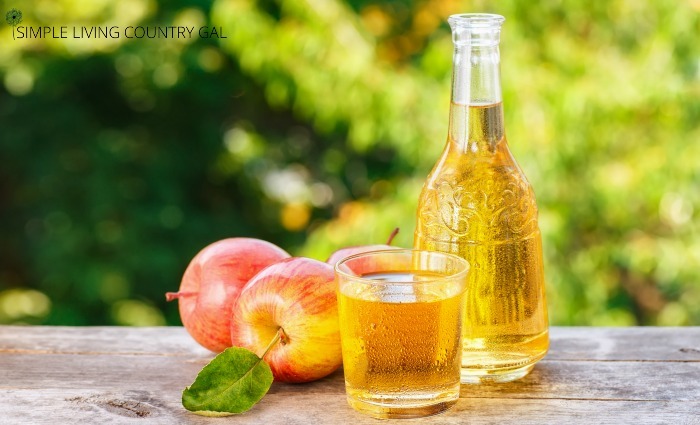 Apple cider vinegar has been shown to boost calcium absorption from feed and treats. This will help improve the quality of your hen’s eggs. Stronger shells mean better eggs. Use #4 Cleaner bums. ACV also helps with pasty bums. Just a couple of drops to a tsp added to a quart waterer can be given to your chicks. It helps to keep bowels regulated and should prevent pasty bum issues which can quickly kill baby chicks if not treated. Pasty bum or pasty vent is when poo sticks to the down around a chicks vent. If not removed (by hand) or prevented it can form a blockage and be fatal to your chicks. To remove use a q-tip dipped in warm water and clean away daily or more often if needed. Use #5 Treating Cocci in chicks and hens. Coccidiosis is an intestinal disease that is animal specific. What that means is chicken Cocci cannot be spread to goats and vice versa. The disease is more common in young chicks but can also be found in older hens. It is passed through chicken droppings and if not caught and treated can spread quite quickly and destroy a flock frighteningly fast. ACV is a form of probiotics which can boost an animal’s immune system. Although ACV is not a direct preventative of Cocci, it does promote strong immune systems which are more resistant to the effects of cocci. By giving your hens probiotics it can help to maintain a normal and healthy level of culture good bacteria in the bowels. This will help to prevent the more harmful (but natural) occurring cocci bacteria from proliferating to the point where it causes scours (diarrhea) and dehydration. I like to add 1 tablespoon ACV to my chicken’s water at least once a week. This really encourages healthy bowels and so far has kept Cocci from affecting my flock. You can add ACV more often, but I have found weekly works best for my hens. 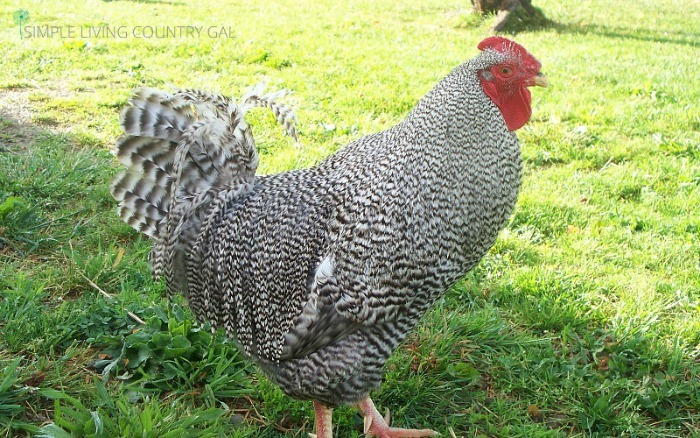 Use #5 Friendly roosters. Another tip that I have read about but have not tried is to put a little ACV in a water bottle to help settle aggressive roosters. The water bottle is used to spray as a deterrent for the roosters. This method is supposed to keep the rooster from attacking owners and has worked quite well for some. I am not sure if it is the ACV that does the trick or the spray bottle itself, but after using this method a few times I read that the roosters learn that the bottle means to stay away. I would use this tip with caution, however. ACV in the eyes can sting and burn so spraying any animal this way can do more harm than good. I would try just plain water at first to see if that does the trick. Use #6 A better cleaner. I mentioned before that ACV is quite effective in preventing pests. 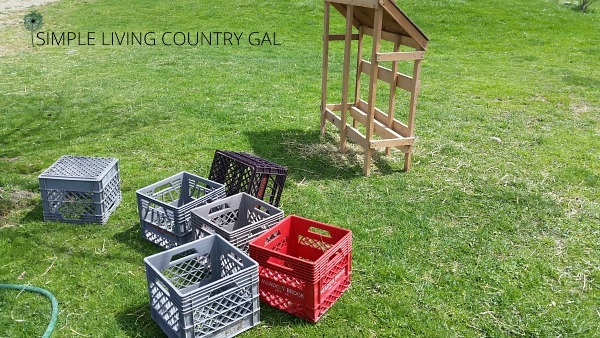 Why not take things one step further and spray nesting boxes down after cleaning. The vinegar spray will deter pests and keep them from infesting your flock. A super simple step that has so many benefits. It is worth noting again. Do not use ACV in metal waterers. It can break down the metal leaching nasty chemicals into the water that you simply do not want any of your animals to drink. Please remember whenever you are adding anything new to any of your animals feeding regime, it is important you do so slowly. This will help your animals adjust more easily and will keep digestive systems regulated. My favorite brand of ACV is Braggs. It can be found now in most stores and also online. I like to purchase mine from Amazon since they have free shipping and keeps me out of the stores where I can easily blow my grocery budget if I am not careful. Bragg Organic Raw Apple Cider Vinegar is made from delicious, healthy, organically grown apples. Processed and bottled in accordance with USDA guidelines, it is Certified Organic by Organic Certifiers and Oregon Tilth; and is Kosher Certified. Bragg Organic Raw Apple Cider Vinegar is full of zesty Apple Cider Vinegarnatural goodness. Its a wholesome way to add delicious flavor to salads, veggies, most foods, and even sprinkle over popcorn. It also pretty easy to make once you’ve got a mother started. The easiest way is to start with Braggs ACV and some raw apple juice. Mix one cup or so of Braggs with the apple juice in a large mason jar (I use these) or other glass container. Place a coffee filter on top and secure with a rubber band. Store in a dark place for a few months. As it ages a cloudy, gelatinous mass will form on the top. That is the mother and what makes the acetic acid. You can use this mother to start more ACV, give it away to others to use or cut the excess up and feed to your chickens. The hens love it and it is full of wonderful goodness. Ninja Tip: If you cannot find unpasteurized apple juice you can take just about any kind of juice, frozen or bottled, and get it to ferment if left somewhere warm for long enough. Making your own truly ensures you do have a mother which to some is an important step they would rather do/see for themselves. There is nothing I love more than promoting health in all of my animals. So many people wait until there is an issue to treat and I am not sure why. By keeping cleaning housing, fresh water, and good quality feed you will be well on your way to healthy animals. Why not take it one step further and build up their immune systems naturally so they are better equipt to fight pests and diseases on their own. As they say, an ounce of prevention is worth a pound of cure! 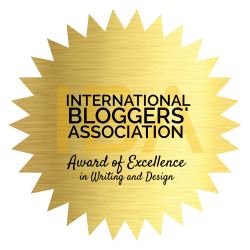 You can find this post and others over at the Homestead Blog Hop. So glad my post article was helpful. I would love to see your new watering system! I am looking to do the same and need some inspiration. Hope you have an awesome day too!